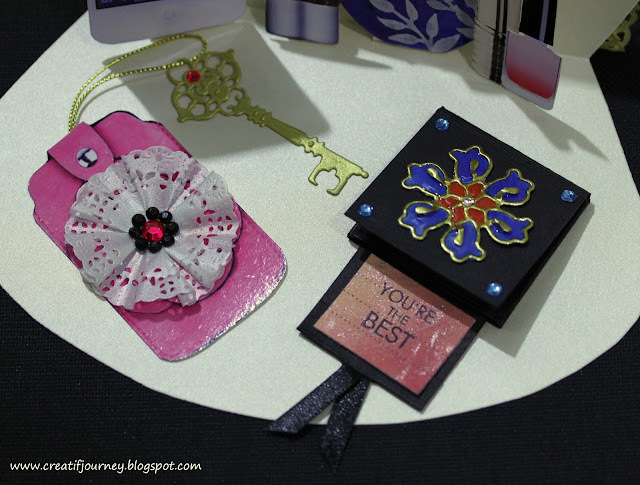 I made a pop-up card for the Simon Says Stamp Pin It! Challenge. For the bag exterior, I cut long strectch of lace using Cheery Lynn Designs Lace Edger die and sew and pleated the lace. 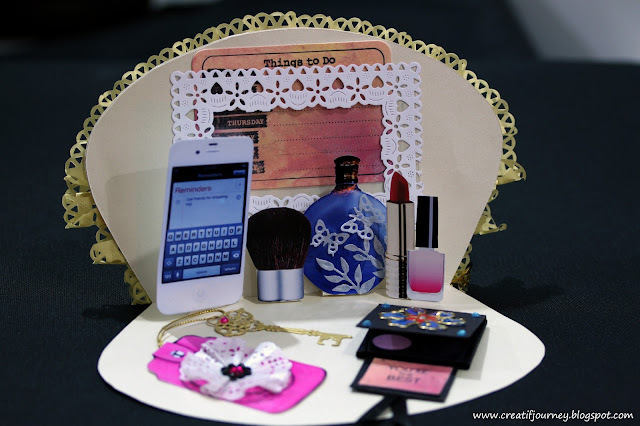 Once the card is opened, the content of the purse are revealed. I created a slot (which is currently holding a Things To Do card) for additional messages. The laces surrounding the slot is cut using Cheery Lynn Designs Scandinavian Hearts frame. I decorated the perfume bottles with butterflies (Cheery Lynn Designs Mini Dimensional Butterflies die and Cheery Lynn Designs Olive Branches die). On the bottom of the page, I have the key holder and a eye-shadow set. I cut a slit in the French Pastry Tiny Doilies and folded them to make the flower on the key holder. As for cloisonné on top of the eye shadow box, I used Cheery Lynn Designs Lace Corner Deco D to cut a gold colored aluminium foil. I painted the holes with markers and sealed them with glossy accents. Beautifully done! Thanks so much for sharing this with us at the Simon Says Stamp Wednesday challenge! Wow this is STUNNING Mee just a fantastic make thanks for sharing and have a wonderful day..
Wow, that is lovely and very clever too !